The New York Indoor Carpenter Ant Kit contains the professional pest control products you need to treat carpenter ants found inside homes, apartments, and other residential and commercial areas. This kit has two baits containing different formulations and active ingredients to increase bait acceptance and efficacy. 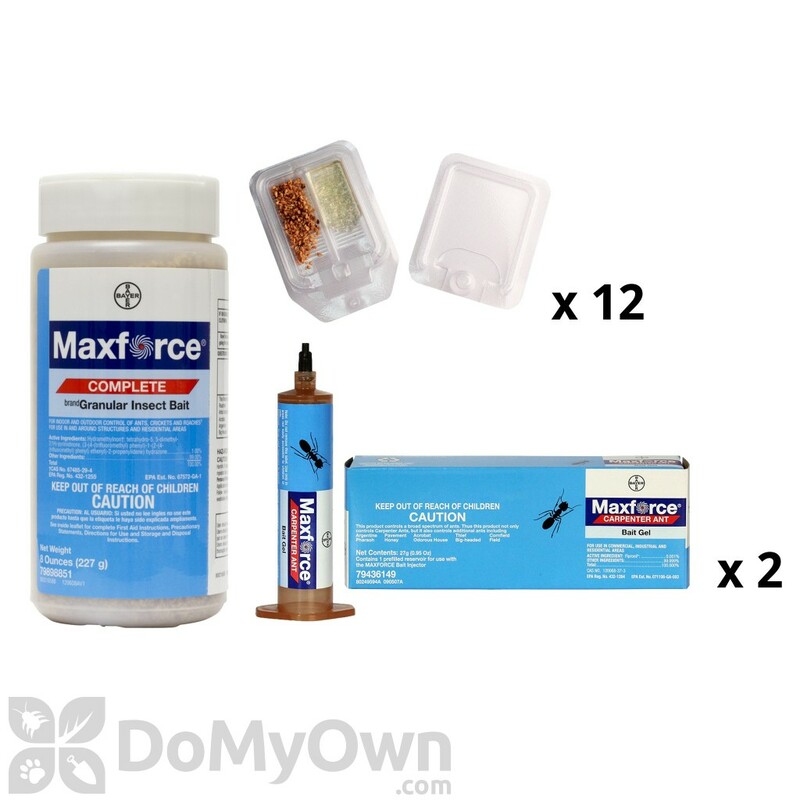 Maxforce Carpenter Ant Bait Gel has a high moisture content and sweet bait matrix with the active ingredient fipronil, while the Maxforce Complete Granular Bait contains a protein bait matrix and the active ingredient Abamectin. The New York Indoor Carpenter Ant Kit also contains bait plate stations that allow you to apply and monitor both baits simultaneously. As with all of our Pest Control Kits, we recommend using an Integrated Pest Management approach to ant control. It is crucial to practice good sanitation by eliminating competing food and water sources, and to eliminate harborage and entrance points to keep ants from entering the structure. If you are able to identify specific carpenter ant nests, you may want to consider additional direct treatment options as well. Although the products in this kit are labeled to control of many species of ants, we suggest you identify the ants you find indoors to assist in choosing the best kit for your situation. See all of our Ant Control Kits here. Before applying any insecticides, it is important to inspect and to prepare the treatment area. Practice good sanitation by eliminating food and water sources that may compete with the baits you are about to apply. Also find ways to seal up and eliminate access points into the structure. These steps will help not only to treat an existing infestation, but also to prevent future problems. Once you have identified the hot spots where ants are entering or trailing indoors, you are ready to use the products in your Indoor Carpenter Ant Kit. *Handle bait stations with clean, dry hands or wear gloves. Avoid handling bait with bare hands as this may make baits less attractive to the ants. 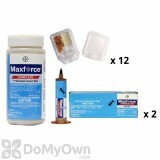 *To apply the Maxforce Carpenter Ant Bait Gel, first gently unscrew the solid black tip of the tube you would like to use. Replace this tip with one of the clear, reusable tips included with your kit. Use either a bait gun or the included plastic plunger to gently expel the gel from the tube, similar to using a syringe. (You may need to pull back gently on the plunger to prevent over-application.) Place a spot of bait about the size of a pea in the other side of each bait plate stations you plan to use. *When you are done applying the Maxforce Carpenter Ant Bait Gel, replace the clear plastic tip with the black solid tip to store bait. *After you have filled your bait plate station trays, snap a lid onto each one by lining up the U-shaped tab and the round tab with the corresponding parts in the tray. Gently press the edges of the lid until it is firmly snapped into the tray, being careful not to tilt the trays, which may cause granule bait to spill. You can remove the perforated tab on the lid to allow ants easier access to the baits. *Maxforce Complete Granular Bait can be applied outdoors as a broadcast, perimeter, or colony treatment. Apply when the ground is dry and rain is not expected for at least 24 hours. See the product label for complete outdoor application instructions. Carpenter Ants gone in less than a week after 5 years of trying other things! Gel lures ants quickly granules carried into crevices by pavement ants. No Carpenter ants SEEN in house since initial , professional treatment 4 years ago with annual outside granular treatment and gel treatment of trees where ants have been seen. I use inside kit just in case. I've had trouble with granules jumping to gel side of tray when I close it. It Stopped them in their Tracks, easy to use. Just Read Instructions.